It is a type of crab of genus Ocypoda that can be seen crawling along sandy shores in many parts of the US and Brazil. As expected, it is a member of the Decapod species. It is commonly seen on shores in many countries. 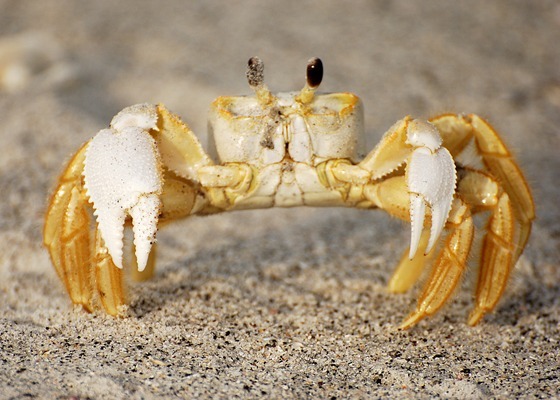 This animal is also known as “Sand Crab” or “White Crab”. These are also known as “Mole Crabs”. This animal has a pale body color that is similar to the color of sand. This makes it nearly invisible when it crawls about over sand. It is because of this apparent invisibility that the crab has got its unique name. The name is also suggestive of the fact that the activities of this creature are mainly restricted to night. This animal has five pairs of legs. The first pair is called Chelipeds and is shaped like claws. The legs, when jointly used, can make crabs move in any direction – forward, backward or sideways. In male crabs of this species, one claw is slightly larger than the other. It has large black eyes that are supported on stalks. Its eyes help it see in any direction. There are horns attached to the end of the eyes of male crabs. It is by these horns that the gender of a crab is recognized. The eyes of these creatures are sensitive to changes in light. The large eyes of these crabs give them a wide field of vision. The eyesight of these creatures is very good. This helps them spot predators very quickly and find out any other threats. It is about 2-3 inches in size. It has a water-tight exoskeleton (external skeletal structure) which prevents the creature from becoming dry. The body covering also lends support to its muscles and organs. With increasing maturity, the crab begins to lose its external skeleton. It comes off at a point, only to be replaced by a new, slightly larger shell. The new shell takes some time to harden and until that happens, the crab remains vulnerable. This creature is found in sandy beaches of tropical as well as subtropical coasts. It can be found anywhere from the American Atlantic Sea, the Mediterranean Sea and the Red Sea to coasts along the American Pacific and the Indo-Pacific. These crabs are usually found in sandy beaches and backshores where they live in burrows. Crabs usually burrow a deep hole to keep themselves cool during the daytime. They remain in burrows during daytime and when winter is at its coldest. It is omnivorous, meaning it feeds on both animals and plants. It can also devour other crabs and detritus. The creature feeds on snails, clams, turtle hatchlings, lizards and small crabs. Ghost Crab foods also include organic matter. This is an exceptional creature that possesses the unique ability to store oxygen in airbags located close to its gills. When the creature buries itself in the sand during winter hibernation, it survives on this stored oxygen. The crab can move on the sand at about 10 miles per hour and is able to change is direction suddenly. It burrows into the sand at a 45-degree angle for a depth of up to 4 feet. It creates holes of 1-2 inch width. Adult crabs of this family occasionally dig a burrow with two entrance shafts. The digging activities of these crabs have been reportedly heard even 2 meters (6.5 ft) away. Ghost crabs generally look for food at night. This is also the time when they dig and repair their burrows. They search beaches for any animal or plant that has been washed ashore. It is rare to see these crabs during daytime as they are mainly active during the night. Mature male ghost crabs neatly pile the burrowed sand next to their entrance. Young and female crabs do not make a neat pile and the sand they dig out is scattered in all directions beside their entrance. Female crabs can identify a male residence by the neat sand pile and get a mate for themselves. Younger crabs burrow and make homes in the area of shore that is closer to water. Older crabs are seen to burrow away from water. These crabs can make three types of sounds, by stroking their right claw on the substratum of their leg, by rubbing their legs together and through their gill chamber. The animal breathes in through its gills. They periodically make their gills moist with seawater. The gill chamber produces bubbling sounds that can be heard by people who go for tanning at the beach. The creature retreats to the ocean while laying eggs. The eggs of this creature turn into marine larvae. This crustacean communicates through sounds with other members of its family. The creature has a unique mechanism on its right claw known as a Stridulating organ. When it strokes this against the bottom of its leg, a squeaky noise is produced. A crab produces this noise to warn other crabs not to enter its burrow. Male crabs also use this sound to attract female mates. Ghost Crabs can make very good pets if properly looked after. If you are planning to breed these crabs in your home, here are some steps that you have to follow. Get a tank of about 20 gallon size. If you want to keep over four crabs in only one tank, it is advisable that you buy one of larger size. Fill half of the Ghost Crab tank with thick sand. Keep little shells, rocks and small plants in the tank. This will recreate an atmosphere similar to a sea shore and keep your crabs entertained! Sift the sand with a small branch or sifter to keep the contents of the tank clean. Do this once every week to rotate fresh sand. The more the crabs you have in the tank, the more frequently you should rotate the sand. Use clams and oysters or even old vegetables and fish to your crab. Repetition in diet can tire your crabs and make their survival difficult. Try to find out which foods your crab like. Feed that often to your crab and also balance it with other foods. Female crabs of this species have a rounded abdominal flap. Thousands of eggs are incubated inside the flap. These are freed into the sea after being matured. The eggs mature into larvae at sea after over two months and then return back to the shore. Studies have shown the density of Ghost Crab harvesting to be around 3000-5000 every km every year. Know some of the most interesting facts associated with these creatures. These crabs can hold oxygen in their air sacs for about six weeks. It wets it gills for two purposes, reproduction and respiration. Occasionally, the crab draws up water from moist sand to moisten its gills. The strong hairy legs of this animal make it run very fast and achieve speeds of about 10 miles per hour. This makes this crab the fastest among all crustaceans. The crab has club-shaped eyestalks and it boasts of a 360° vision. This helps it see and catch insects that are even in mid-air. It has the exceptional capability to shrink back its eyes into grooves located on the frontal area of its shell. Contrary to what many think, these creatures cannot swim in water. However, female crabs can keep themselves afloat by turning upside down in water. This is done to let the egg mass under their abdomen respire freely. Occasionally, the crabs go out into the sea to protect themselves from predators such as raccoons and birds. They devour baby turtles while they hatching out in the sand. The crabs drag the baby turtles into their burrows and eat them up. Crabs of this species usually engage in a combat that is non-contact. The combat style is more ritualistic in style and ends in contact in very rare cases. Want to know how these crabs look like? Here are some useful Ghost Crab Pics. Check out these Ghost Crab photos to get an idea about the appearance of these creatures. This crab changes its pace as its speed increases. It can walk for an indefinite period of time on four pairs of legs. At very high speed, it raises its fourth pair off the ground. At highest speed, it uses only the first two pairs of walking legs to keep running. I have some very good examples of ghost crabs that are thousands of years old. They are calcified and only found in the area I live, in Florida. If you are intereted I can send pics. I also have a paper on the subject from a local university. I’m writing a field report on ghost crabs right now (Ocypode quadrata). I’d be very interested in reading the paper you’ve got =). I am a park ranger in Florida. 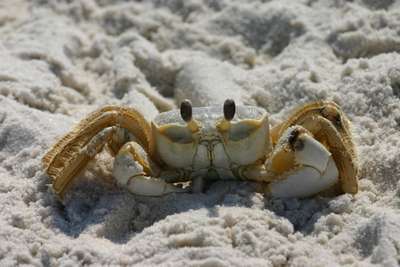 I will be doing a ranger program on ghost crabs soon. A couple of pics of the ghost crab fossils would be great to add to the program! Thank you! Hope you see this comment. I’m interested in seeing more photos of the sand crabs 🙂 would you mind sending me some? yes, we study bird nest productivity on our Florida State park beaches and ghost crabs have been documented in eating snowy plover eggs,chicks and make attempts at eating adult plovers. They also eat least tern eggs and harass least tern adults on nests. We have some footage on youtube looking at defense mechanisms feigning broken wing to lure ghost crabs away from snowy plover nests. Question about sand crabs – we have been watching them all week at a NC beach. However, last night there were none to be found. It is close to a full moon – does this have any impact on them? All other nights have been cloudy. If not, any idea why they would be out one night and not another? My husband and I found one on the coast of Galveston over labor day weekend. It was a pregnant female. She had her thousands of larvae last night. Would love some advice on how to care for all the larvae. We have an established 100 gallon saltwater tank and would hate to put all the larvae in there with all the fish. These things are cool! Is it possible to spot a Ghost Crab in Maine? I’ve never heard of these types of crabs. Would a ghost crab pinch like an ordinary crab? Thanks. It’s interesting to hear that this crab is nocturnal. My husband and I have been frequenting the Playalinda Beach near Titusville Florida, and this last month we have been watching many many ghost crabs during the day. We are absolutely fascinated by them! They display all of the characteristics and activities that you mention. We have seen one baby that is almost minuscule and is already displaying the exact behavior of burrowing out its hole. From our chairs we can sometimes see six or seven of them at a time within our vision. They are very very cautious and can move like lightning. We took a video with our phone that shows a crab flinging its load of sand away from its hole. Very entertaining creatures. Thank you for this interesting information. It was pretty weird to hear they were nocturnal. Do they have a type of exercise or health for the ghost crab just asking because if they do that is a cool thing! I’m originally from Rhode Island but currently living in Central Florida. I was sitting on the Beach in Cocoa and all of sudden I felt a tickle on my toe. I sit up to find a white and yellow crab at my feet. I was so shocked to see this crab so close to me and not to mention how this crab touched my toe. Very interesting and beautiful crab. Came on here to find more info. How do they flick the sand out of their burrow? We live near a protected barrier island, and enjoy taking our small whaler out to spend part of a beautiful day, to walk the sandy beach that extends about 20 undeveloped beautiful miles, sit and watch waves without people except for the usual few surfers, locals, and visitors. I saw this crab, who appeared to be alive, with so much color and very large, yet was not moving. I took a photo of it and sent it to the island’s preserve group who studies and protects the island’s wildlife. It is apparently a ghost or sand crab. I could not believe they shed their exoskeletons! It looked larger than one of the normal N. C. sized crabs, but now I know why it looked alive yet was not, nor was it inside it’s body at all, not dead, just the shell left behind. I can attach a photo if you are interested. Thanks for the information on your site that they actually recommended to me, from the Masonboro Island Reserve. Thank you Debbie! It would be helpful if you’d attach a photo or two of the exoskeleton that you saw.